Compete against HSC musicians for the title of 2017 Best HSC Solo Performer. Battle it out with other bands for the title of 2017 Best HSC Band. Performances will be judged by leading University staff musicians, HSC Music teachers and Bachelor of Music students. All entrants will work with the best Sound Engineers at Western Sydney University to design their performance. Select performers will be offered a place in the 2018 Bachelor of Music program. Record an EP in the University's new state-of-the-art studios. Bring friends and family to watch bands and soloists battle it out for the coveted prize. 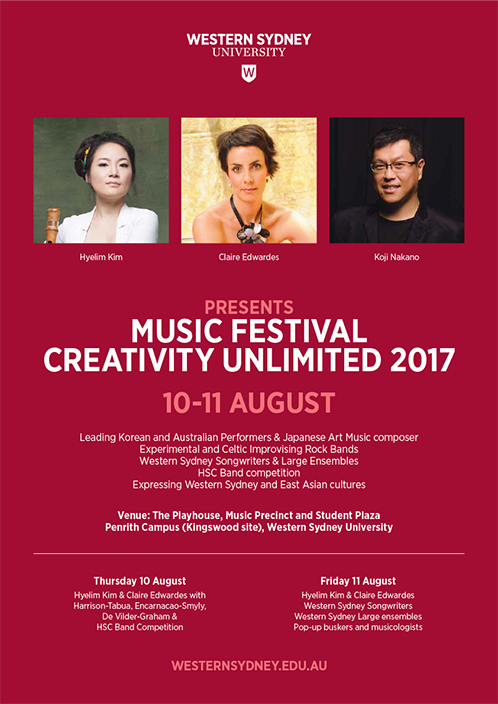 See cutting edge performances by Music staff and students at Western Sydney University. If you wish to compete in the competition at the Music Festival, please click here. If you only wish to attend the Music Festival, please click here. If you are a teacher who is registering on behalf of your students, please click here. Check out our Music Festival from last year! Performers featured in this video of festival highlights include Holly Harrison, Michael Kieran Harvey, Timothy Phillips, DNIG!, Espadrille, Joseph Tabua, Luke Beesley, Julia Fahmi and Georgia White.